Now I really have to put the River Views series on a bit of a hiatus until I have some more photos ready, but there is still a lot of unposted stuff from the City Views around. 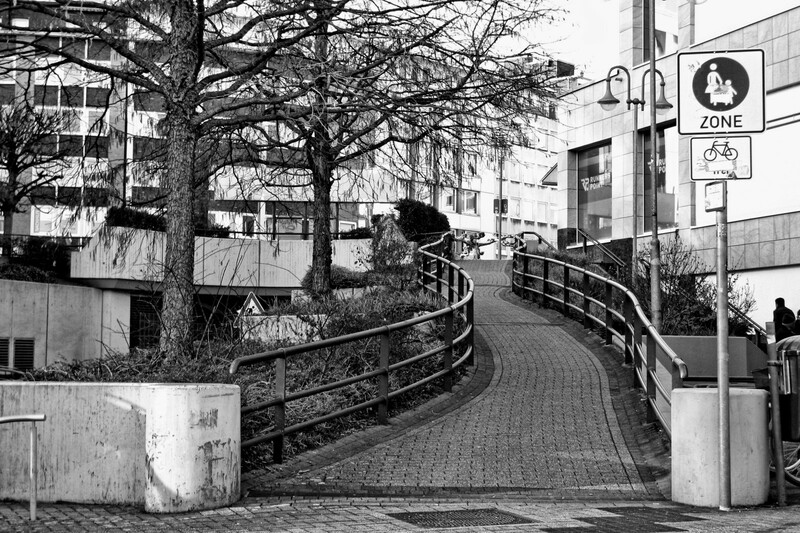 This was taken right next to the west entrance of our local shopping mall and here you can see how the Eppinghofer Straße comes through the tunnel on the left below the pedestrian zone on top of it and merges into the Kaiserplatz. This little-used walkway goes from the Kurt-Schumacher-Platz above (also known as the Pflasterstrand) down to the area of the Kaiserplatz. Most people go through the shopping mall and use the escalators or elevators between the basement and the pedestrian zone level, though.